Goodeed, a Banque Postale subsidiary, and its founder, Vincent Touboul-Flachaire, received an invitation from Bill Gates in late September. This goes to show that his idea for free, ad-funded charity donations has been a hit! 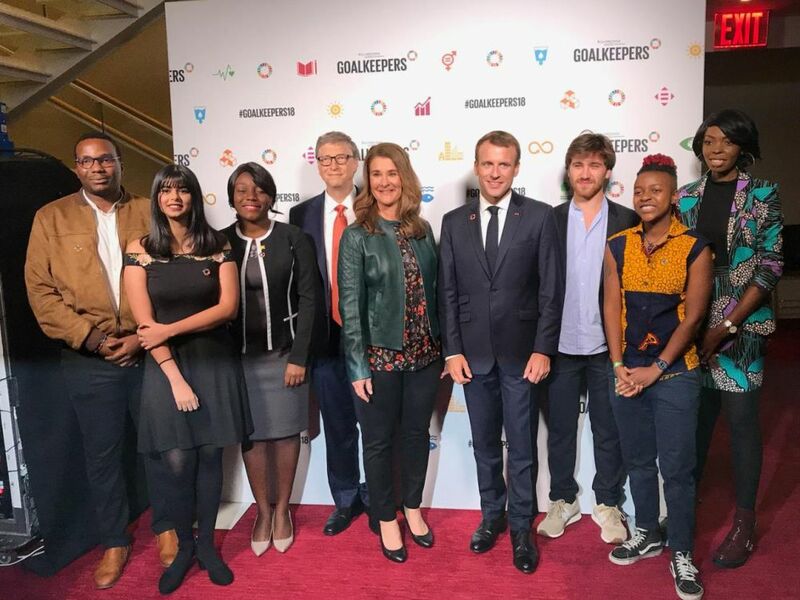 Goodeed, the free, ad-funded site for donating to NGOs and non-profits acquired by Banque Postale and KissKissBankBank&Co in March 2018, was part of the Goalkeepers* event in New York in late September. Organised by Bill and Melinda Gates, this humanitarian event receives an incredible amount of media attention. The world's most famous business leader and philanthropist founded Goalkeepers to advance sustainable development and fight poverty around the globe. Each year the ceremony is attended by leading humanitarian figures: last year it was Barack Obama and Malala Yousafzai, while this year it was Emmanuel Macron and Graça Machel, international defender of women's and children's rights. On the stage for the second annual ceremony attended by around 500 guests in late September were seven "young Goalkeepers" chosen from across the globe. Vincent Touboul-Flachaire was the only French or European delegate. The 22-year-old entrepreneur created the eco-friendly advertising scheme known as Goodeed in March of 2014 to transform ad revenue into donations to NGOs and non-profits. The idea is simple: internet users can select the cause and organisation they want to support, then they can view ads on the Goodeed site. Then they can make their donations without spending a cent. The money for the donation comes from the advertiser. The idea has already captured the interest of 70 non-profits and NGOs, including UNICEF, Restos du Cœur and Handicap International, 282,658 members – mostly young people – and nearly 90 brands, including Philips, Coca-Cola, L'Oréal and Société Générale. These free donations have already helped put €16 million toward 130 projects: 140,000 trees have been planted in India and 12,000 meals have been given out to the homeless. With this recognition from Bill Gates, the idea of free donations passed a new milestone this autumn. The world's most famous business leader and philanthropist founded Goalkeepers to advance sustainable development and fight poverty around the globe. As the specialised press put it, "made-in-France sustainable business ventures have tremendous potential". To learn more about Gooded, visit their web site. * Goalkeepers is a multiyear event with the aim of making progress toward the United Nations sustainable development goals (global goals).